This is a beautiful spiraling hollow rope chain which closes with a secure lobster clasp. The 10k rope has a diamond-cut finish which accents the piece to have an 18k luster; therefore these ropes are extremely popular since they offer both, a classic design with maximum gleam. Looks attractive with or without a pendant. Great Gift! Gift box available! Images are enlarged for better view and are not actual size. Refer below to the product specifications column for approximate item info. If you have any questions about this product by SL Chain Collection, contact us by completing and submitting the form below. If you are looking for a specif part number, please include it with your message. 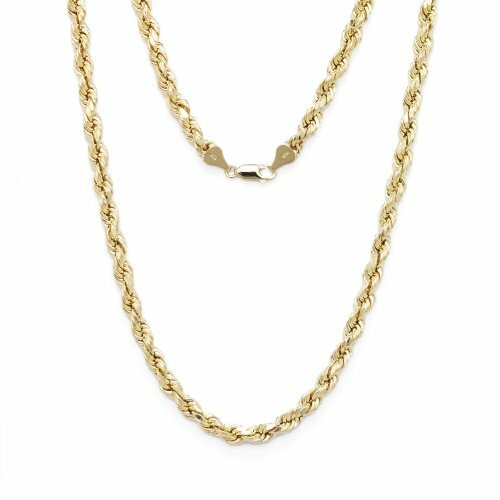 14k Yellow Gold SOLID 1.5mm Diamond Cut Rope Chain Necklace with Lobster Claw Clasp - 22"
14k Yellow Gold SOLID 1.5mm Side Diamond Cut Rolo Cable Chain Necklace with Lobster Claw Clasp - 18"